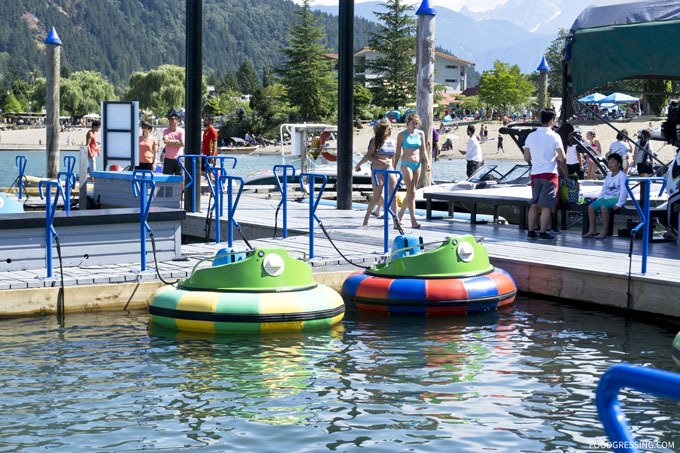 When my family and I visited Harrison Hot Springs a few weeks ago, we decided to take part in some water fun. 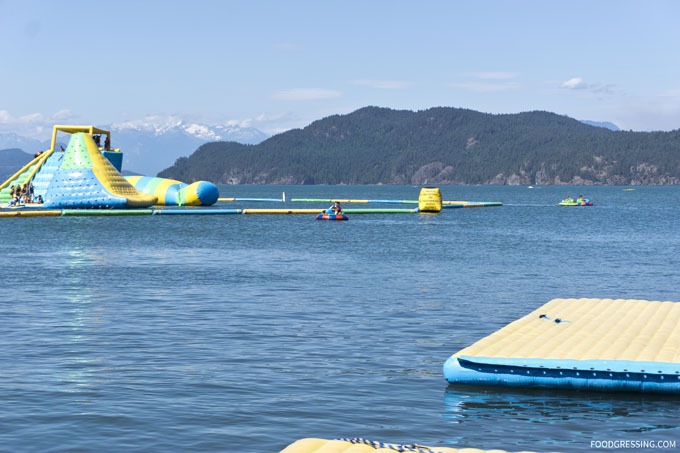 Some of the water activities that are available at Harrison Hot Springs include renting sea-doos or bumper boats and playing at the inflatable Water Park. 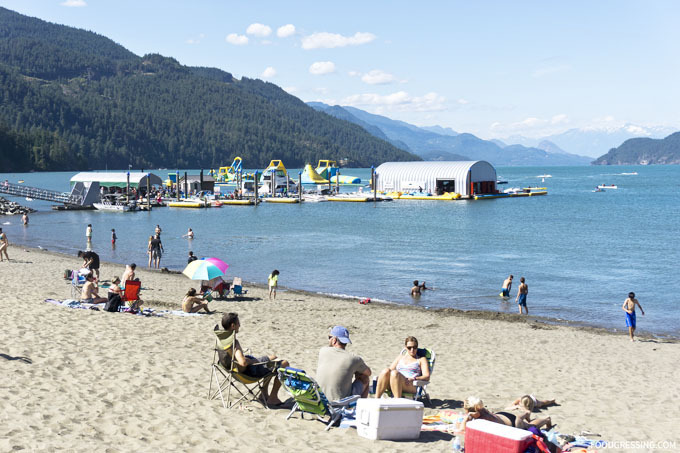 The Marina for the rentals and admission to the Water Park is located across the Harrison Hot Springs Resort. 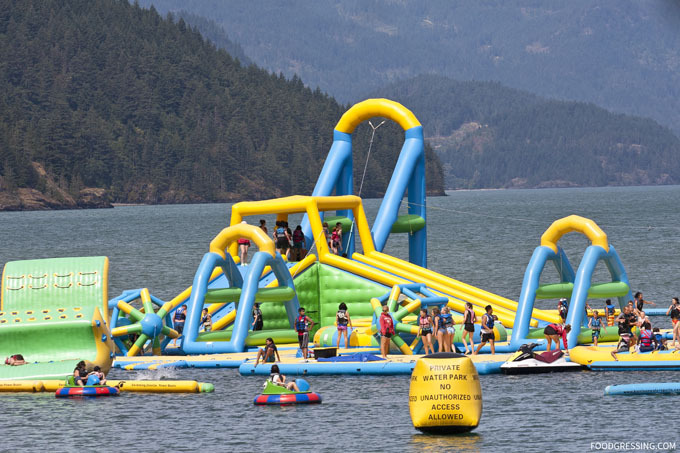 My family and I rented the electric bumper boats which are loaded with squirt guns. The water gun is capable of squirting your opponent up to 10 feet away. 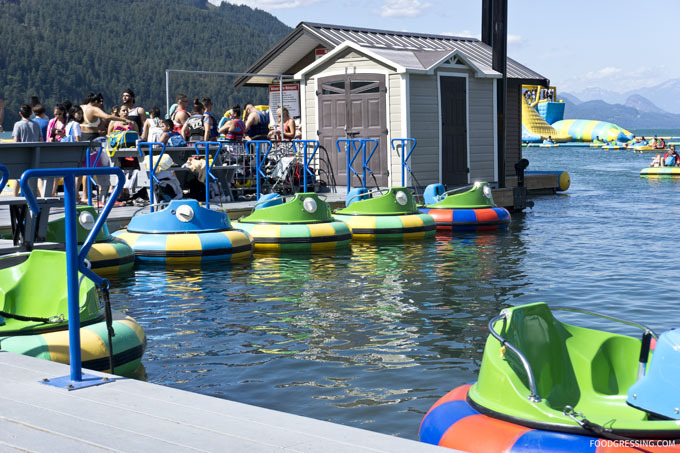 The bumper boat rentals are $20 for a half an hour and can accommodate one adult or one adult and 1 child under 8. 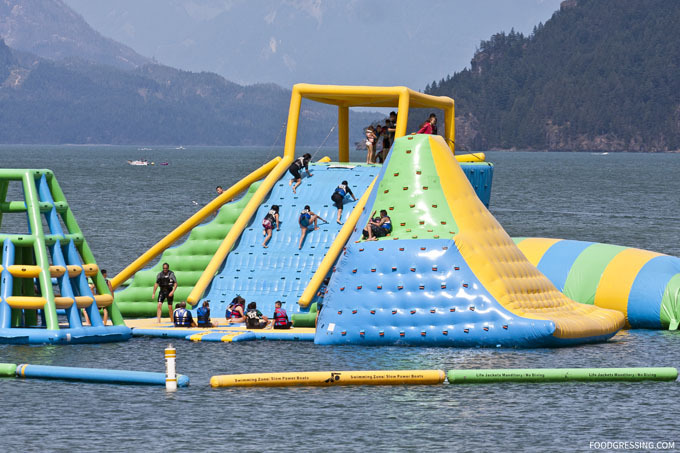 In terms of distance, you can only go as far as the area surrounding the Inflatable Water Park. 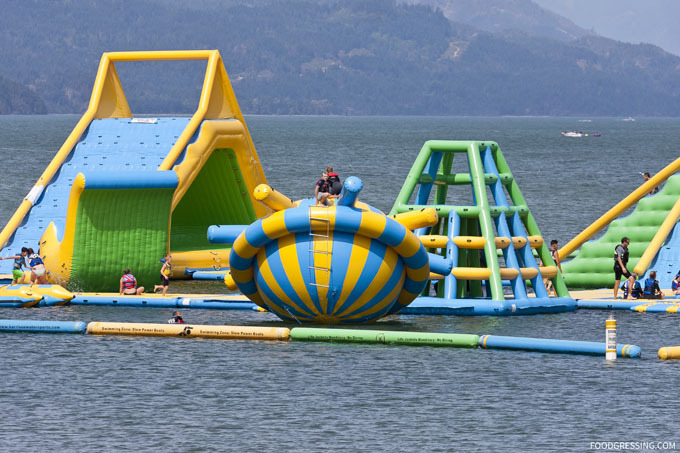 The Inflatable Water Park certainly is a highly entertaining attraction at Harrison Hot Springs. Check out this amazing view with aerial shots of the park. We didn’t visit the Water Park ourselves but we got a good look at the activities there from the bumper. 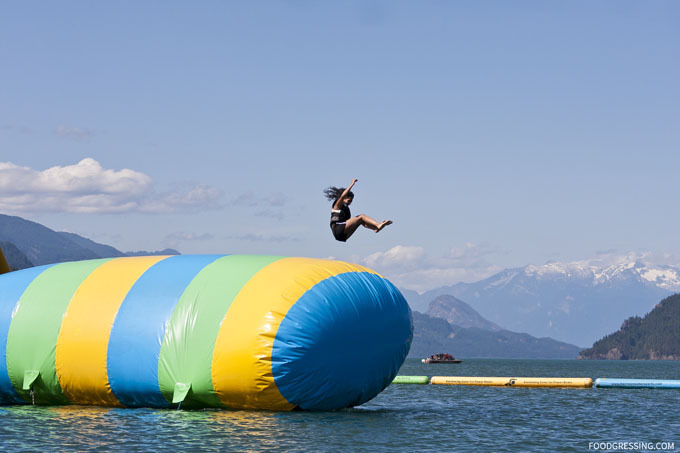 Admission is $29 per person per day. 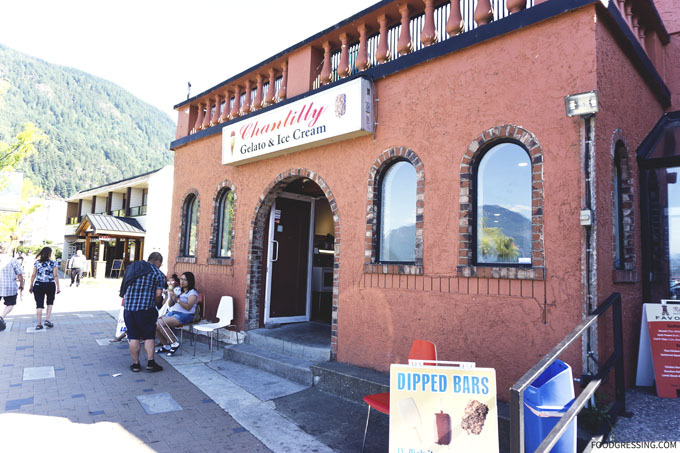 After a less than stellar experience at Chantilly, my family and I decided to visit a different ice cream spot right after while visiting Harrison Hot Springs. 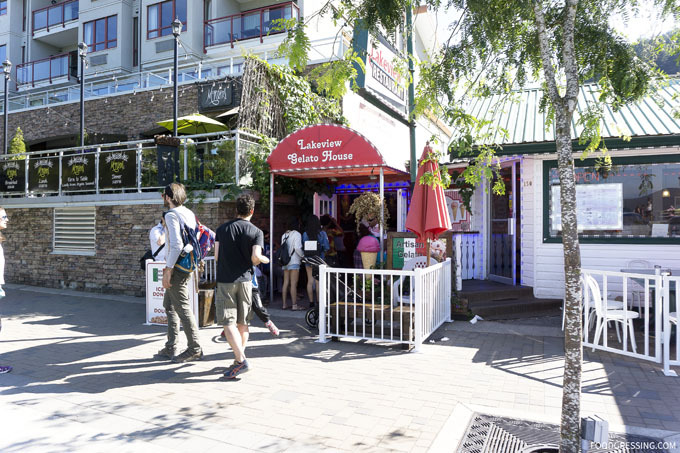 This time, we went to Lakeview Gelato House which is part of Lakeview Restaurant – a place that serves fish and chips, burgers etc. Note: None of the food in this review was complimentary. This review is done anonymously. 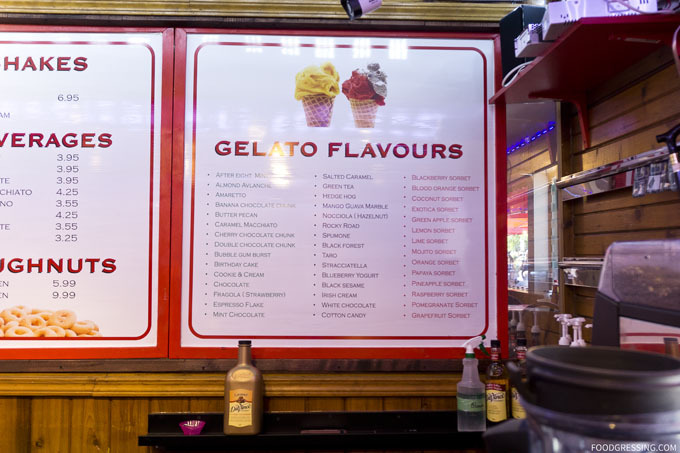 The interior of Lakeview Gelato seemed retro-inspired with wooden panels, red finishings and neon lights above. 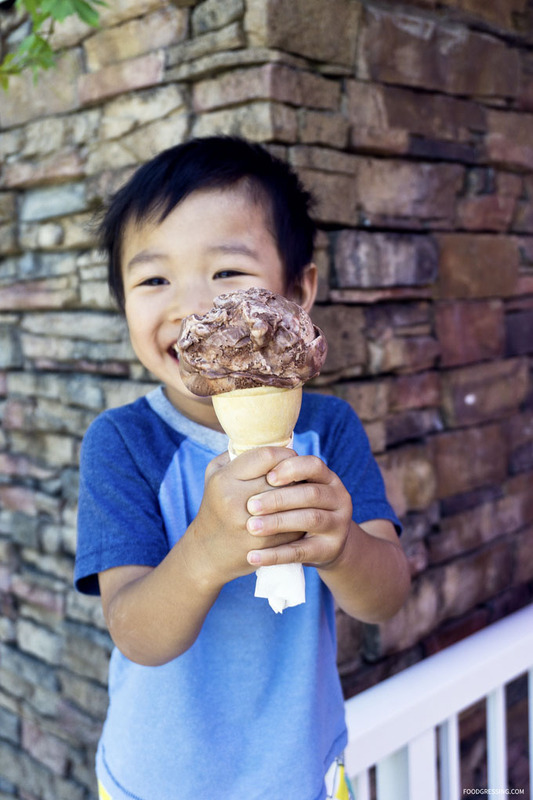 Customers can enjoy a single ($4.95) or double scoop ($7.95). 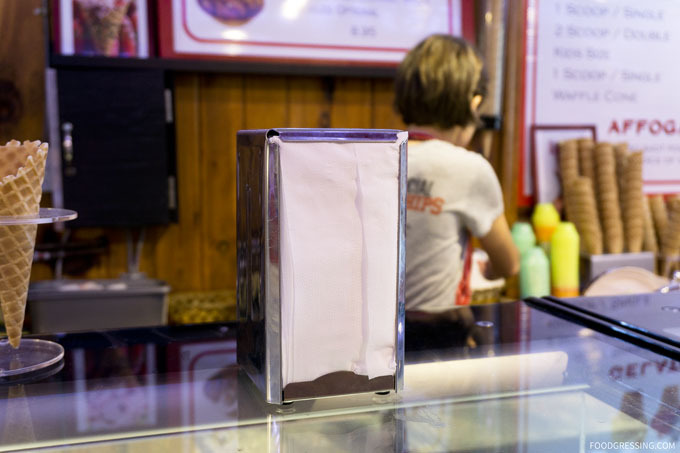 Kid’s cones ($3.65) are also available. 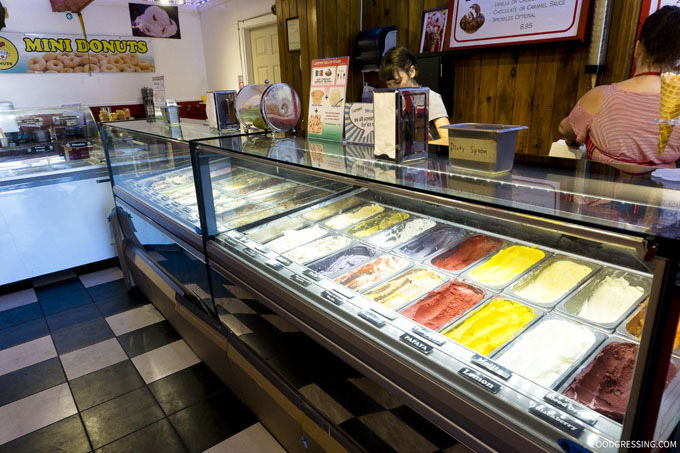 They have quite a range of interesting gelato flavours like Caramel Macchiato, Taro, Black Forest, and Irish Cream. And unlike elsewhere, I quite appreciated the napkin dispenser available! After sampling a few flavours, my son decided on the hedgehog gelato in a kid’s cone. And the size of the scoop was quite reasonable for the price, I thought. The hedgehog flavour tasted just like Purdy’s hedgehog chocolates but in ice cream form. Very delicious, but not overly sweet. I highly recommend it. 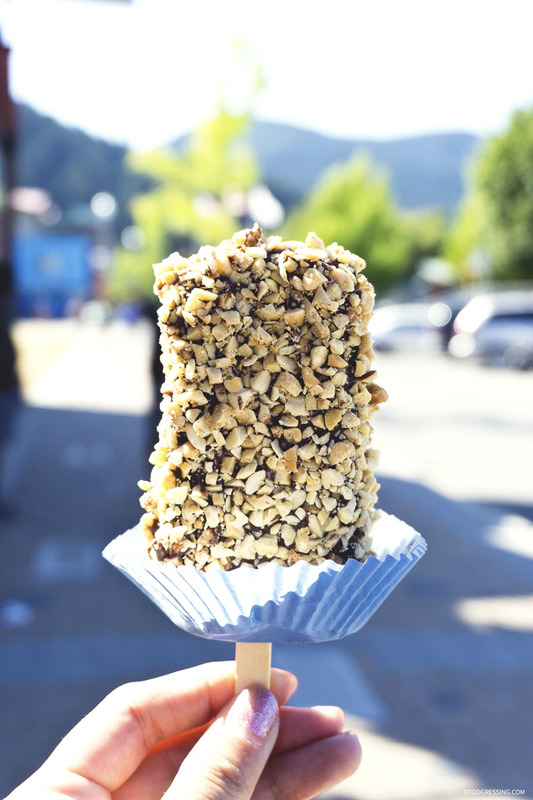 On our day trip to Harrison Hot Springs recently, my family and I decided to cool off from the summer heat at one of the local ice cream shops. We stumbled upon Chantilly Gelato & Ice Cream and decided to go for one of their dipped ice cream bars. The dipped ice cream bars come in vanilla or coconut and the dips are either white or dark Belgian chocolate. Toppings include nuts and sprinkles. 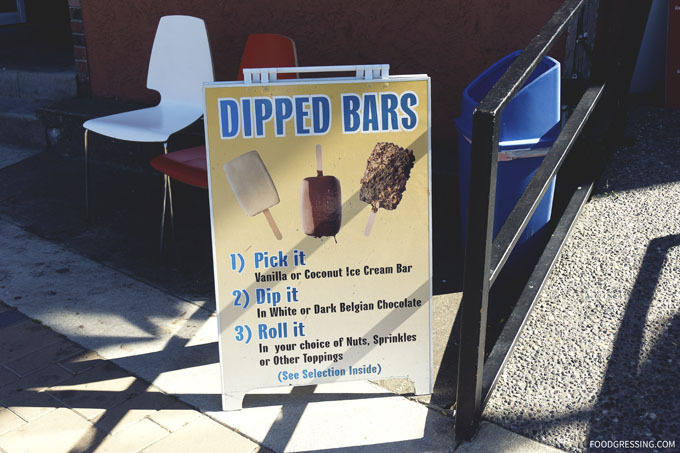 Unfortunately, the dipped ice cream bar was not executed as well as one would have hoped. It started off when the vanilla bar was overly melted by the hot chocolate dip. What resulted was a very soft ice cream centre. The girl who prepared my bar had to redo it a second time because the chocolate coating had come off completely while being rolled in hazelnuts. It was clear that the ice cream was too soft to support the chocolate shell. The toppings were very crunchy but the enjoyment of the bar was short-lived as it melted too quickly. Furthermore, it seems that Chantilly is a bit stingy on the paper napkins as there was no dispenser available in the eating area. I had to ask the staff for napkins of which they just gave two sheets. Not good if your ice cream was melting faster than expected. With restrictions on paper napkins and a poorly executed dipped ice cream bar, I’d say Chantilly gets only a 2.5/5.